My credit union, Lake Michigan Credit Union, requires that I make 10 debit card transactions per month, to get 3% interest on my checking account. I do not want to miss out on the interest, because it is virtually free money. The only problem is, I use my credit cards for everything. In fact, if a retailer doesn’t accept credit cards, I will just buy a gift card with a PIN and use that instead of a debit card. So, here are a few ways to get debit card transactions without missing out on too many points. This is my favorite method, because I use Amazon regularly and you can purchase $0.15 Amazon gift cards, so there are no fees. The whole process only takes about 5 minutes, so it is not very time-consuming either. 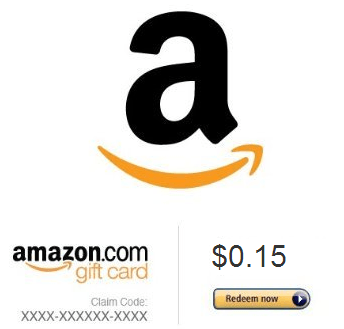 Simply go here to purchase each $0.15 Amazon gift card. Square Cash is relatively new, but I really like their system. Basically, you send money to friends or family with a debit card through an email. If you sign-up, they will send you a $1 for free. Then you simply send your friends, or yourself if you make two accounts, $1 at a time. There are no fees, which is what makes Square Cash so great! Venmo is just like Square Cash. You can send money to friends with a debit card for free. You will need two people for this, because it hooks up to Facebook (make sure you find a friend you can trust). Another nice thing about Venmo is, you can send money with a credit card for a 3% fee. I would not suggest doing this often, but if you are in a pinch to hit a sign-up bonus, it is an easy way to do it. If all else fails, there is always Amazon Payments. I would use this as a last resort, because there are much better ways to use AP (i.e. gift cards bought with a category bonus and cards you are trying to hit minimum spend with). If you have any other suggestions, leave them in the comments.